Two thousand and fourteen was a year filled with much sad news for animals: beyond the billions of animals who died in slaughterhouses, there were horses run to death on race tracks, dolphins led to their demise in the bloody cove of Taiji, animals killed in zoos, and thousands of water buffalo slaughtered in a single mass sacrifice, for example. So let’s celebrate some of the many positive changes animal advocates were able to help enact this year. Here are 12 in chronological order. When Canada’s animal ag industry announced in March that its new Code of Practice for the Care and Handling of Pigs would include a ban on continuously confining pregnant sows in gestation crates, it was big news. 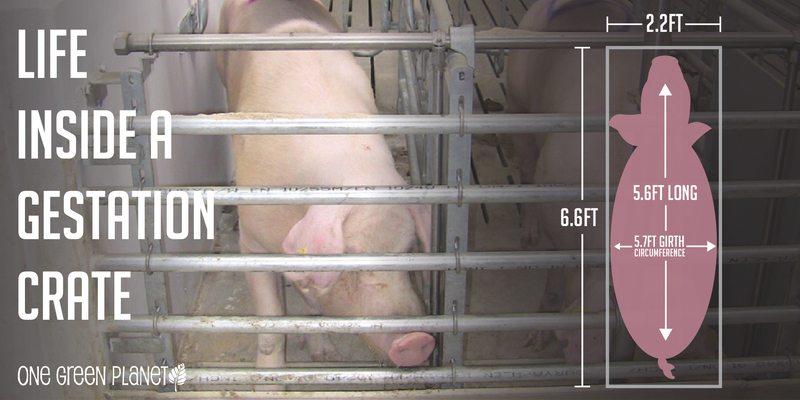 These cages confine sows so tightly the animals can’t even turn around, and they are standard practice on pig farms throughout North America. The new guidelines from the National Farm Animal Care Council require all new or renovated facilities after July 1, 2014, to house pigs in groups rather than cruel gestation crates. The ICJ’s 16-judge panel ruled 12 votes to four in favor of Australia’s argument that Japan’s whaling program was not in fact designed and carried out for scientific purposes. The court ruled that Japan must revoke current whaling permits and refrain from issuing any more. Almost as stunning as this decision was Japan’s announcement that it would abide by it. Stunning, but not definitive, since Japan’s whaling industry recently declared it would flout the decision and unveiled plans to resume Southern Ocean whaling in 2015. Looks like Sea Shepherd is due for another busy season in the Antarctic. This leaves Air France as the only major airline in the world still willing to ship monkeys to labs. You can ask them to stop here. When the WTO rejected an appeal by Canada and Norway to overturn the European Union’s four-year-old ban on seal fur, meat, and oil, it set a precedent that animal welfare can trump the right to trade. Thousands of seal pups are killed during the “hunting” season, often being shot and then clubbed to death. Indeed, more than 2 million seals have been killed in Canada since 2002, making the country’s commercial seal slaughter the largest killing of marine mammals on Earth. Because most Canadians oppose commercial sealing, the sealing industry relies almost exclusively on export markets to sell its products. The decision by the WTO’s appellate body, which is final, found that complaints by Norway and Canada that their seal trade was being affected were outweighed by the EU’s objective of protecting seal welfare through the ban. Well, maybe that’s an exaggeration. But so much positive news for animals came of out India this year that I am just going to lump it all under one heading here. First off, in May, the country announced it was banning testing for cosmetic products and their ingredients on animals. This was followed by news in August that India banned animal dissection in universities, replacing it with digital alternatives. Then, in October, we learned that India had also banned the import of cosmetics tested on animals, making it the first animal-tested-cosmetics-free zone in South Asia. And in December, an Indian court declared that Raju, the “crying elephant” who was chained and abused for 50 years, could not be returned to his tormenters; he would remain in a sanctuary. Oh, and if you’d like to live in a meatless city, pack your bags for Palitana, India, recently declared to be a 100-percent vegetarian zone. Let’s not forget this is the country that also banned dolphin shows in 2013, declaring dolphins and whales to be nonhuman persons. After anti-vivisection campaigners applauded the Brazilian state of São Paulo for banning the use of animals in cosmetics testing, Brazil’s federal government took note. A few months later, the country joined the European Union, India, Norway, and Israel in declaring a nationwide ban on the practice. Ruling so-called “crush” videos that graphically depict animal cruelty are not a protected form of speech, the U.S. Court of Appeals for the Fifth Circuit reversed a 2013 ruling by the U.S. District Court in the Southern District of Texas, which had held that animal crush videos are not obscene and that the Act violated defendants’ First Amendment rights. In 2012, defendants Ashley Nicole Richards and Brent Justice were arrested in Houston and charged with violating the Act for producing and selling obscene videos of Richards torturing dogs, cats, and other animals for the sexual gratification of viewers. Both companies said the timing was coincidental, but animal advocates knew better. When Southwest announced it was terminating its 26-year marketing relationship with the king of orca exploiters, the move was clearly motivated by pressure from activists around the world who have urged the airline to end their partnership, saying the carrier was supporting animal cruelty. Call it the Blackfish effect. 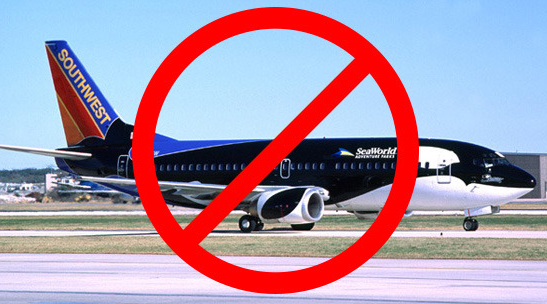 Officially, Southwest and SeaWorld parted ways due to “shifting priorities.” But after a quarter century of mutual marketing (Southwest planes were emblazoned with orca and penguin images, while SeaWorld promoted the airlines in its parks), it is clear that Southwest hearing from its customers and the general public made all the difference. It’s hard to believe we still live in a world where not every country has animal welfare laws, but that world got a little bit smaller this year as Thailand passed its first legislation covering companion animals as well as farmed animals, working animals, wild animals in captivity, and animals under human care. Police have been given the power to enter homes and businesses to investigate claims of animal abuse and neglect, and violators can be fined up to THB 40,000 (US$1,200) and/or up to two years in jail. The law has been criticized as being too broad and far from perfect, but then, can’t the same be said for the animal welfare laws of every country? Let’s celebrate this as a major step forward and praise the Thai government for acknowledging that animals have the right to legal protection. The U.S. military has long been one of the biggest abusers of animals, inflicting death and painful injuries on more than 300,000 dogs, cats, goats, pigs, mice, fish, sheep, birds, rabbits, rats, and nonhuman primates every year. One of their most controversial uses of animals has been for medical training programs—from the poisoning of monkeys to study the effects of chemical warfare agents to shooting goats with high-powered weapons in “wounds labs” so military medical personnel could practice treating them. As of January 1, 2015, live animals will be replaced with substitutes such as realistic human dummies and high-tech alternatives. The Department of Defense ordered an end to the use of live animals thanks to campaigning from PETA and other vocal animal advocates. With the decision to change its policy, the U.S. joins 22 of 28 other NATO member nations that have already abolished the use of animals for training. What I love about this victory—and the similar one in Los Angeles earlier in the year—is that it not only means bullhooks will be illegal for use on “circus” elephants in the city, but that Ringling Bros. and Barnum & Bailey Circus, which uses these implements of torture and lobbied against both bans, will be crossing Los Angeles and Oakland off its tour list after the bans take effect in 2017. Outlawing bullhooks in these two cities has encouraged lawmakers in other municipalities, including Austin, to consider bans. 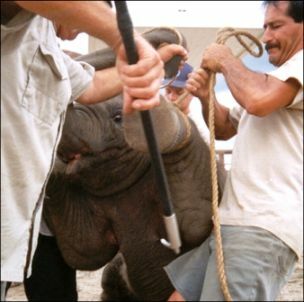 After the Los Angeles ban, the Rhode Island House of Representatives passed a non-binding resolution urging circuses and other traveling animal shows to eliminate the use of bullhooks and other “harmful training practices” that cause elephants pain. Here’s to another year of victories for animals! Maybe we’ll even see a federal ban on animal testing on cosmetics in the U.S.